Laparoscopic fundopliction(LF) has become the treatment of choice for patients who need surgery for gastroesophageal reflux disease(GERD). In this retrospective study, we outline our experience with laparoscopic fundoplication over a 10 year period. 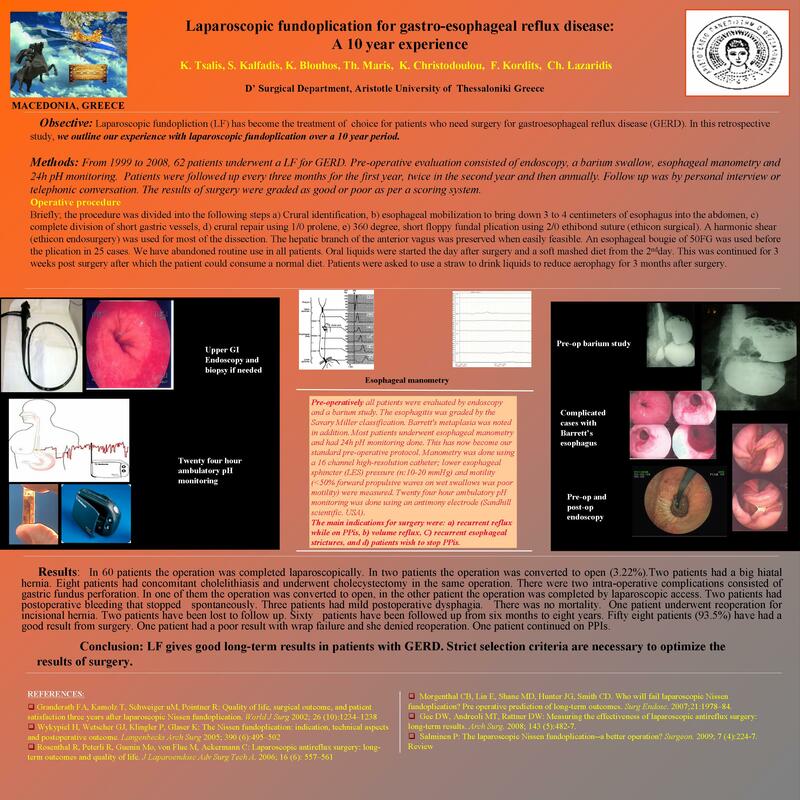 Materials and Methods: From 1999 to 2008, 62 patients underwent a LF for GERD. Pre-operative evaluation consisted of endoscopy, a barium swallow, esophageal manometry and 24h pH monitoring. Patients were followed up every three months for the first year, twice in the second year and then annually. Follow up was by personal interview or telephonic conversation. The results of surgery were graded as good or poor as per a scoring system. Results: In 60 patients the operation was completed laparoscopically. In two patients the operation was converted to open(3.22%).Two patients had a big hiatal hernia. Eight patients had concomitant cholelithiasis and underwent cholecystectomy in the same operation. There were two intra-operative complications consisted of gastric fundus perforation. In one of them the operation was converted to open, in the other patient the operation was completed by laparoscopic access. Two patients had postoperative bleeding that stopped spontaneously. Three patients had mild postoperative dysphagia. There was no mortality. One patient underwent reoperation for incisional hernia. Two patients have been lost to follow up. Sixty patients have been followed up from six months to eight years. Fifty eight patients (93.5%) have had a good result from surgery. One patient had a poor result with wrap failure and she denied reoperation. One patient continued on PPIs. Conclusion : LF gives good long-term results in patients with GERD. Strict selection criteria are necessary to optimize the results of surgery.